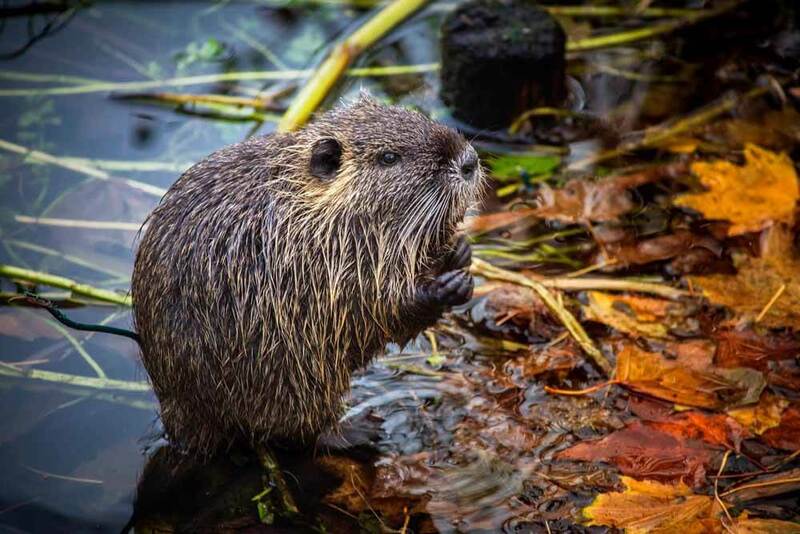 Hogarth’s Wildlife and Animal Removal specializes in Muskrat removal. A Muskrat is a semi-aquatic rodent native to North America. Standing at one to two feet long, it has a stocky body with a round head. Its long, scaled, black tail measures at 7 to 12 inches and is flat; working like a rudder to help the Muskrat swim. They often cause problems for people with ponds on their property because they build their nests into the banks of ponds. As a result, this causes problems with erosion over time. If your pond has a fountain or water system installed, they tend to chew the wires of these systems which is time consuming and costly to constantly replace or repair. They have can and will chew through the exhausts of boats which can cause them to sink. Muskrats live in groups with the male, female, and their young. They’re extremely territorial and most fights between groups will end in death. It is most effective to trap Muskrats out of ponds. There is no way of completely stopping them from infesting the banks of your pond, above all it’s best to be put on a maintenance program to ensure they are gone. There is a three step process to effectively remove them from your property. Disrupt their diet by cutting and removing vegetation that grows in and around the pond. Remove the muskrats from the pond by trapping. The pond banks will additional dirt or gravel backfill.